How do you fancy exploring lush tropical forests, awe-inspiring Mayan temples, or sandy beaches stretching out as far as the eye can see, gently brushed by balmy trade winds, and lapped by a crystal-clear ocean? From east to west, all this and more can be yours in Mexico! Discover the mysteries of the Mayans at Chichen Itza. 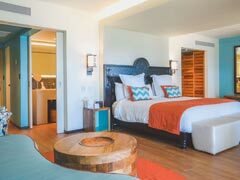 This November 2017, rediscover a totally redesigned Club Med Cancún Yucatán, the ultimate all-inclusive family Resort located at the tip of Mexico’s iconic Riviera Maya in the state of Quintana Roo. 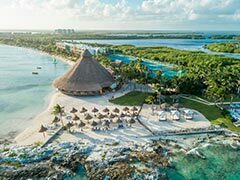 Alongside three white sand beaches and the world’s second largest coral reef, between the Caribbean Sea and the lagoon, Club Med Cancún Yucatán, offers an extensive array of water and land sports and easy access to the ancient Mayan wonders. 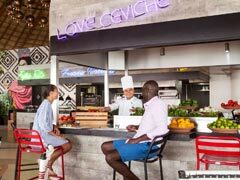 You’ll love the ultimate Mexican dining experience, a new wine cellar, and a totally revamped Resort centre including a new main pool and lounge area. 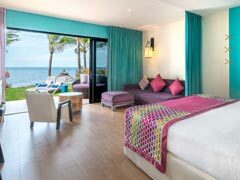 And for those seeking a luxurious, exclusive retreat, indulge in the brand new Jade 5 Trident Luxury Space. This dream family holiday will sweep you off your feet! Coming this July 2017, this bar will welcome you to a newly redesigned area for a modern Mexican experience. Spend quality time with your loved ones all-day long in this unique beachfront setting. 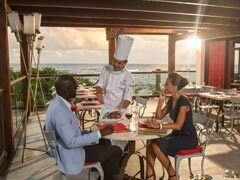 This buffet-style restaurant located at the centre of the Resort is open for breakfast, lunch and dinner. 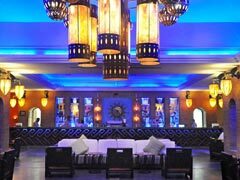 Enjoy an array of international dishes as well as local Mexican cuisine. 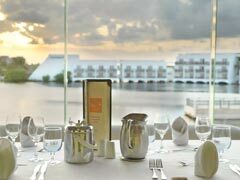 Choose to dine in one of its 5 themed, air-conditioned dining areas overlooking the pool & lagoon. Baby high chairs and baby food are available. Our speciality Argentinian restaurant serves late breakfast, late lunch, a la carte evening meals, and snacks. 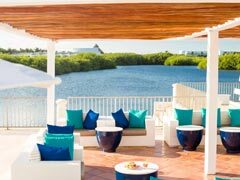 Built on a private peninsula, the Resort sweeps out in a semi-circle, between the blue-green waters of the Caribbean and a lagoon. 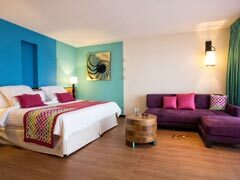 The Club and Deluxe Rooms are located in brightly-coloured two-storey Mexican hacienda-style buildings. Some have direct access to the beach, facing the sea, lagoon or garden. For those in search of premium comfort and customised services, the 5 Trident Luxury Space offers Suites and Deluxe Rooms. 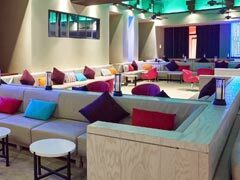 A comfortable and stylish Club Room on the ground, 1st or 2nd floor, with a partial view of the sea, lagoon or gardens. The seafront Topacio and Turquesa buildings house spacious and elegant Deluxe Rooms (some are inter-connecting). These secluded, spacious Sea View Suites are perfectly sized for comfort and afford the finest ocean views. From July 2017 The new design concept includes an in-room Bluetooth system and a fragrant shower system, for a relaxing and exotic experience. 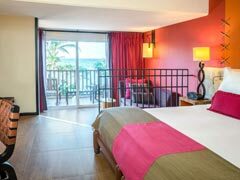 Relax in the spacious and comfortable Deluxe Garden View rooms with balcony or private garden and new in-room Bluetooth system. 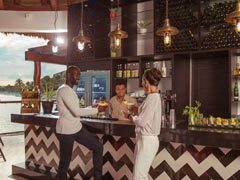 Indulge in an exclusive experience at the redesigned pool & bar area. 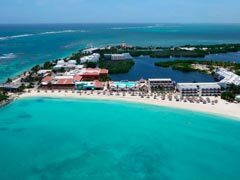 Relaxing on the white sand beach, or discovering the wonders of Tulum or Chichen Itza**. Choosing between waterskiing, windsurfing, Scuba diving and the flying trapeze. Seeing your children playing at pirates or little sailors at the Petit Club Med®. Relaxing in a bath of flower petals at Club Med Spa by COMFORT ZONE. Chilling out in a 64 sq metre 5Ψ Luxury Space Suite and enjoying customised services ** UNESCO World Heritage Site. With the benefit of over 40 years’ Club Med experience behind it, our Resort proposes innovative clubs for children and teenagers: Dedicated areas specifically designed for their needs, and equipment designed with a view to comfort and safety. G.O®s with a passion for their job. Numerous activities for all ages: sport, creative activities and games for the different age groups. Opening hours that allow parents to make the most of their stay, and respect the children’s desires and sleeping patterns. For information: the children’s clubs are open all week, except Petit Club Med®, closed on Saturday. In France, G.O®s with a BAFA (State diploma for youth group leaders) or childcare qualification, depending on the age of the children; in other countries, an equivalent local diploma or relevant experience. 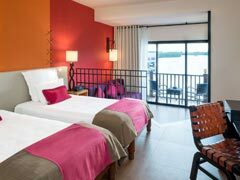 Age-specific clubs: Petit Club Med® (2 to 3 years) (extra charge), Mini Club Med® (4 to 10 years) (included), Club Med Passworld® (11 to 17 years) (included). Hotel amenities and facilities for kids: BABY SITTING From 4 months to 7 years (extra charge), CLUB MED BABY WELCOME® (FROM BIRTH TO 23 MONTHS) Until 23 months (included), PYJAMAS CLUB From 4 months to 7 years (extra charge), BABY CORNER From 4 to 23 months (included), PLAYGROUND (included). Activities for kids: LITTLE TENNIS From 3 to 4 years, LITTLE SOCCER From 3 to 7 years, LITTLE BASKETBALL From 3 to 4 years, PETIT CHEF PROGRAM From 4 to 10 years, MINI CLUB TALENT SHOW From 4 to 10 years, LITTLE CIRCUS From 4 to 5 years, TEEN SPA From 11 to 17 years (extra charge). Activities Service included: Archery School, Flying Trapeze School with circus activities, Fitness School, Windsurfing School, Tennis School, Sailing School, Waterskiing & Wakeboarding School (from 18 years old). Activities Sports included: Basketball, Beach soccer, Beach volleyball, Snorkelling, Table Tennis, Waterpolo, Aquafitness, Tennis, Mini golf, Dynamic walking, Cardio and weights room, Beach tennis, Kayaking, Swimming-Pool, Stand Up Paddleboarding. 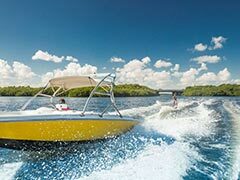 Activities Sports extra charge: Big game fishing, Scuba diving, Golf (green fees), Snuba, Flyboarding.